As I was thinking about what kind of simple, yet delicious recipe I wanted to create for this contest, I remembered my favorite recipe, chocolate mousse! I started out with the idea to simply take out the middle of a Reese's cup, mix it with the peanut paste and and put it back in, but things evolved, and I now have the recipe below. It is not truly "Double Stuffed", the name just stuck!! I hope you enjoy making, and eating this recipe as much as I do! 1. With a kitchen knife, scoop the peanut paste out of Reese's cups. Placing a cardboard square under the Reese's and leaving the cup cover on, is key. 2. Melt chocolate chips, scoop them into large bowl, and combine with vanilla ice cream until smooth. 3. Scoop chocolate into Reese's cups, chill for 20 minutes. 4. If desired, cover tops with caramel sauce. 5. Sprinkle with crushed Graham crackers. 6. 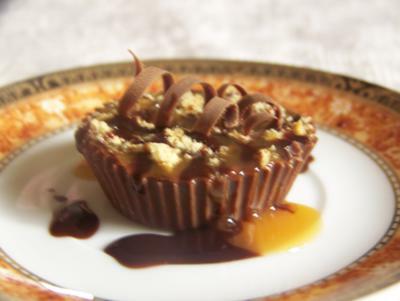 If desired, use potato peeler and cut thin twirly stripes from chocolate bar and place on top (see picture above).